North Marion Middle School teacher Elyse Hansen received a $2,500 classroom grant from Farmers Insurance's Thank America's Teacher program. Hansen is an 8th grade English Language Arts and Humanities teacher at North Marion. She applied for the grant to expand her classroom library. After submitting the application, Hansen needed to obtain enough votes to win the grant. She did just that. 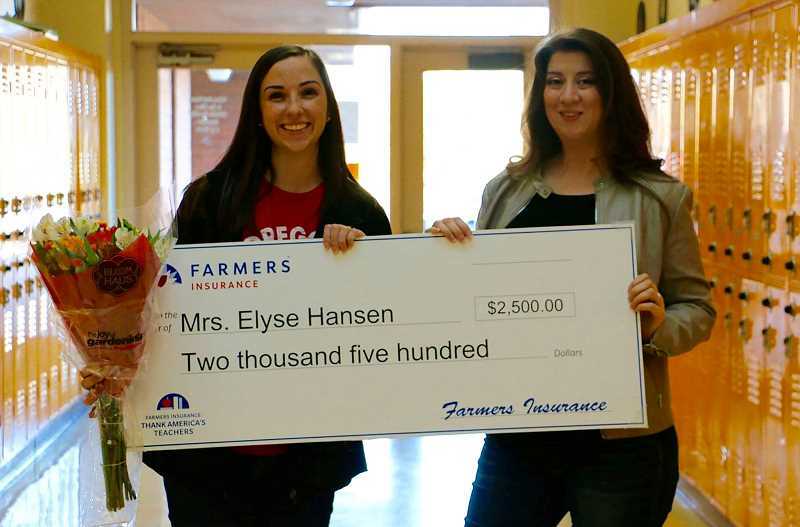 Canby Farmers agent Christina Gutierrez surprised Hansen with the check on Tuesday, Nov. 20. She hopes to be able to hand out more checks in the future. "I would love it for other teachers to contact me at my office if they are interested in hearing more about the Farmers Insurance Thank America's Teachers Grant program," Gutierrez said. "I'm so happy to help and support our local teachers. They work so hard."